Herewith, Todd Brown’s wonderful blog review of “Wake of the Riddler,” available as part of “the Fish the Fighters and the Song-girl” anthology of Sacred Band Tales, and now as a stand-alone Kindle short novel. Available a stand-alone Kindle book or as part of the first volume of Sacred Band Tales, “Tempus with his right-side companion Niko” in print or e-book editions for Nook and Kindle. 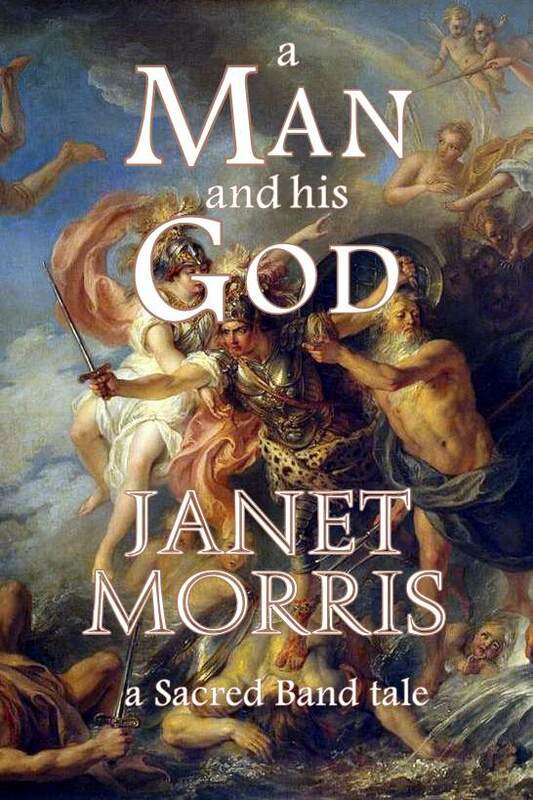 This Sacred Band Tale is also available in print as a part of “Tempus with his right-side companion Niko,” a Perseid Publishing book by Janet Morris, on Amazon (and as a Kindle ebook) and Barnes & Noble (and as a Nook e-book) and from fine booksellers everywhere as a trade paperback. The Sacred Band’s newest review on Amazon review. We always focus on the human condition and its evolution. When we write fiction it is mythic in nature, allegorical, and lyrical. When we write nonfiction it is often cautionary, ground-breaking, and/or controversial since for many years we served as research directors and senior fellows at Washington think tanks, specializing in long-term strategic planning for international security. When we are writing fiction we read nonfiction, often in areas of ancient history and archaeology, international security, defense policy, military history, cosmology, philosophical problems of space and time, genetics of behavior, or emerging threats and technology. When we are writing nonfiction we read fiction or early writings from the Ancient Near East, Ancient Greece, and classical BCE sources. We also will read different translations of note and critics of substance, and like particular translators such as Dryden and Richmond Lattimore and Harold Bloom. We reread Spenser and Marlowe and Shakespeare and Milton and such poets as Byron as well. 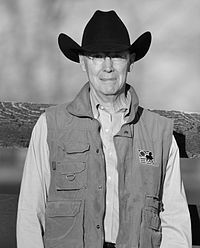 When we write either fiction or nonfiction, we run the risk of stylistic deformation or “print-through” from whatever we’re reading: echoes of other styles and perceptive devices that can creep into otherwise cohesive work; so we are careful about what we read for pleasure when we are writing. We also continually research any area in which we are writing while we’re writing, so we read material that explores aspects of concepts involved in the book or paper or story we’re writing. We are most excited about our newest mythic novel,“The Sacred Band” (and the accompanying releases of “Author’s Cut” editions of classic works in our “Sacred Band of Stepsons” series). In addition to the new, expanded and enhanced release of classic “Sacred Band Tales,” we have also resurrected our “Heroes in Hell” series with the first 21st century title in this series of shared-world anthologies, “Lawyers in Hell,” soon to be followed by “Rogues in Hell.” Both series were bestsellers in the 20th century and we are thrilled to introduce them to a new readership. This book is deeper, more ambitious, and more a novel than a genre book. There’s nothing formulaic about it. “The Sacred Band” is called on its cover “a novel.” It is all of that. Because of its breadth, it bears as much relationship to the “fantasy” of Homer and Shakespeare, of Marlowe and Milton and Spenser, as it does to modern, narrowly-constructed works in any genre. Most of all, this book is about the Sacred Band Ethos and mankind’s relationship to its cosmos. Gods help their favorites and the Balance of the cosmos itself shapes the action. Some have likened Tempus and his Sacred Band, and this book in particular, to the heroic, lyrical, brutal fiction of Robert E. Howard – and in some ways that comparison is justifiable. In other ways, The Sacred Band bears more resemblance to Umberto Ecco’s “The Name of the Rose” and other modern fantasies grounded in historical events. 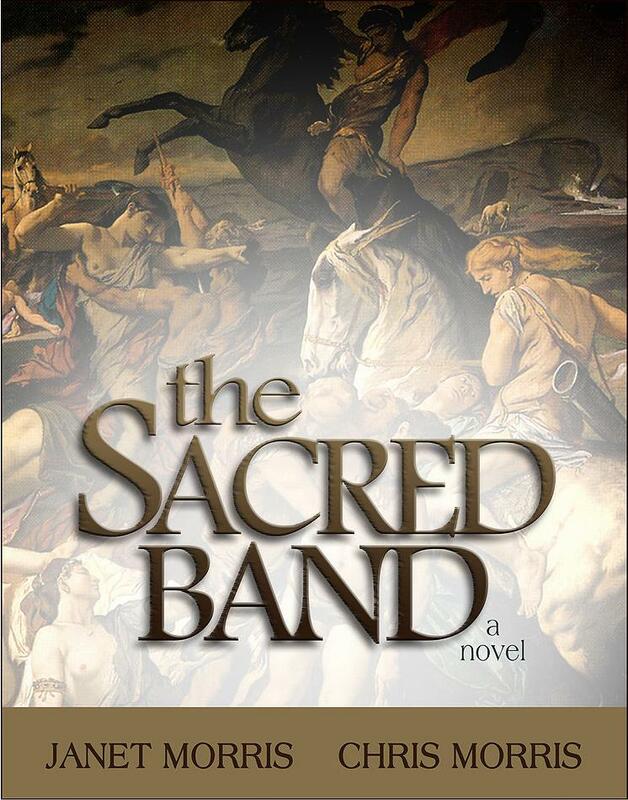 However, The Sacred Band is more tempestuous, more metaphysical, and a story of unique proportions: “an adventure like no other.” BecauseThe Sacred Band begins with the rescue of forty-six famed warriors from an historical battlefield where the bones of two hundred fifty-four of their companions are buried in a mass grave, The Sacred Band gives one answer to what happened to the forty-six skeletons missing today from the grave at Chaeronea. Such an historical mystery exists nowhere else and makes this book even more unique as it blends truth and myth and legend and fantasy into something new. Since the greatest Sacred Band in history, the Sacred Band of Thebes, was massacred by Alexander and Philip of Macedon at Chaeronea, bringing Sacred Banders into fantasy was one way of saving their ideals, if not their persons. For years we wrote one “Sacred Band of Stepsons” story per year, and then wrote more about them in three novels (“Beyond Sanctuary,” “Beyond the Veil,” and “Beyond Wizardwall”). Then we wrote three more novels of Tempus and his Sacred Band (“City at the Edge of Time,” “Tempus Unbound,” and “Storm Seed”). Soon after, we ceased writing fiction for about 20 years to work on the nonlethal weapons concept. When we came back to fiction in 2009, we realized that we COULD write about the Sacred Band of Thebes in a fantasy context: tell a tale of survival of the forty-six… and more. So “The Sacred Band,” daunting to conceive but joyous to write, was born. 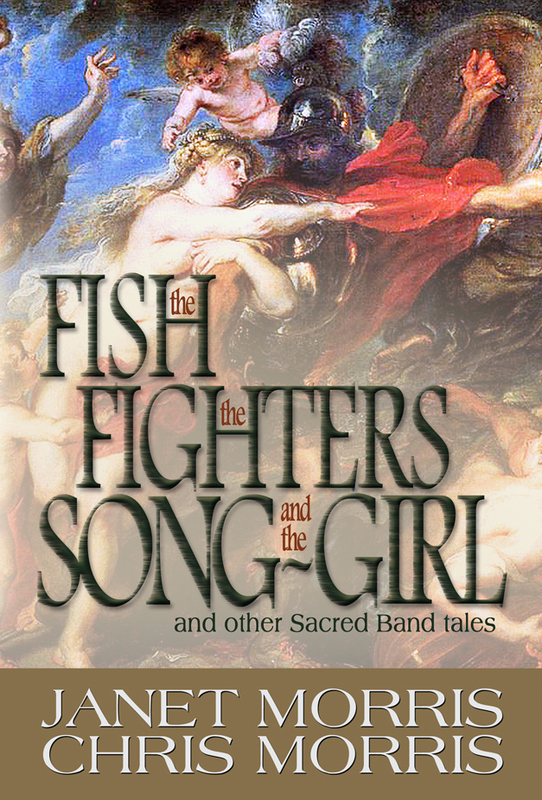 And we have followed it with “the Fish the Fighters and the Song-girl” , a novella in our newest anthology of the same name, which picks up the Sacred Band of Stepsons stories after the battle for the land of dreams is lost and won, and takes the Band into unknown realms for new adventures. The two Sacred Band Tales anthologies, first “Tempus with his right-side companion Niko” , followed by “the Fish the Fighters and the Song-girl,” weave together all the classic 20th century Sacred Band Tales, surrounding them with new material available nowhere else. As authors, we explore the human condition, the nature of being, and provide examples of ethos in action and story. We also write the book we want to read, so our multilayered approach to fiction, with its questions of humanity’s place in the cosmos, is always fresh to us Our goal is constantly to experience and explore concepts important to our species through the imposition of an artistic temperament and the mechanism of story, which is how the human brain organizes information. 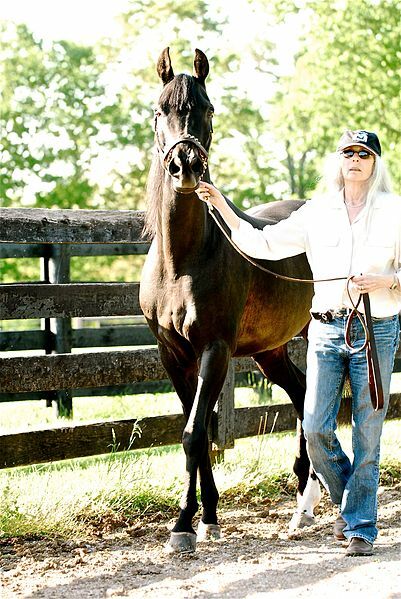 But most of all we hope to inspire the reader, show the glory of life, and help us come to terms with mortality. We are currently of the opinion that the universe has no boundary conditions, and therefore neither does the human mind, beyond those that we impose on ourselves. We try to free the reader’s mind by taking it to a world in which what is important can be considered and experienced without concerns of contemporary fads or politics: find what is eternal about us, and set the reader’s mind free thereby. Next on deck is a story for “Rogues in Hell,” (due out July, 2010 from Perseid) in which we bring this volume of twenty-two stories by different writers to a climax. After that, comes a new Sacred Band of Stepsons novel, which will deal with what happens AFTER a god or goddess immortalizes a mortal: many myths deal with the salvation of favorites by gods or goddesses, but none say what happens next: this adventure underpins the next Sacred Band novel. One book? One author? Impossible to answer. In fiction? Homer’s Iliad. Shakespeare’s Hamlet or MacBeth – a tossup. Marlowe’s Faustus. Milton’s Paradise Lost. In nonfiction: all of Marcus Aurelius, all of Sun Tzu, all of Herakleitos’ Cosmic Fragments; what remains of Sappho; Harold Bloom’s Book of J. “The Sacred Band,” as well as the follow-on “the Fish the Fighters and the Song-girl” and “Lawyers in Hell” can be found on Amazon and Barnes and Noble; some editions are available everywhere by order and on iTunes and from various other e-book and physical book vendors, including Kerlak Publishing. 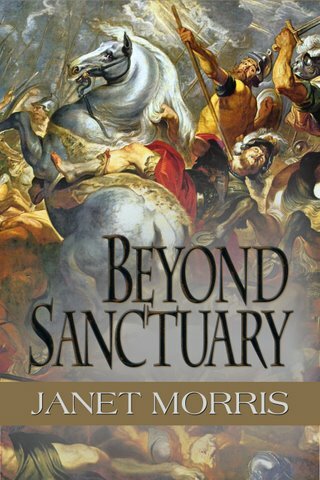 The “Author’s Cut” (revised and expanded) editions of “Beyond Sanctuary,” “Tempus with his right-side companion Niko,” are available on Barnes and Noble and Amazon and through affiliate vendors worldwide. 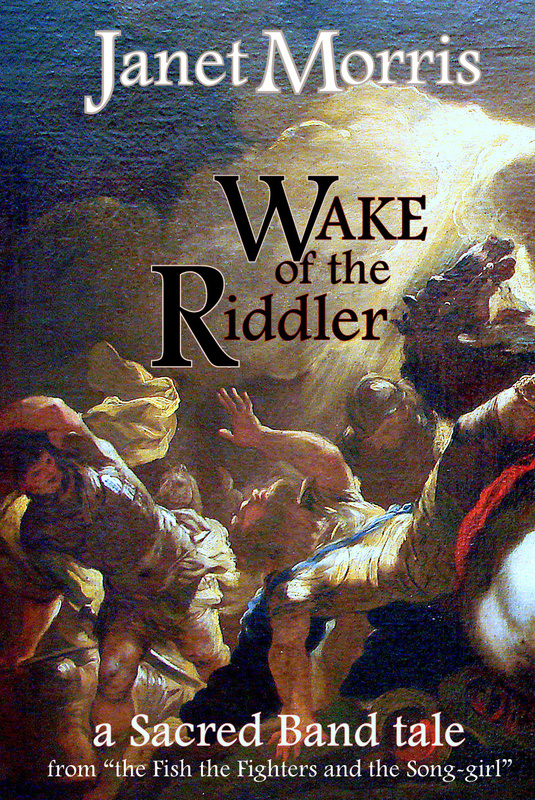 “Wake of the Riddler” and “Mage Blood” are available as Kindle e-books only. We have many additional titles that have not yet been reissued but can be found used, all the way back to “High Couch of Silistra” . Most of our 20th century books are available as used books through Amazon, Barnes & Noble, and numerous other outlets. There are good and bad aspects of “self-publishing.” Some such books could only be published by the creator, meet few of the criteria that a publisher would apply to selection – and yet even these may find a constituency among people of like mind. Many have poor production values: front matter and book formatting are too often nonstandard in self-published books, which is not good. But there have always been books for every level of readership: At Perseid we say we publish “for the experienced reader.” The books we publish have a certain gravitas, crisp description, a literate style. We are known for including new authors, emerging authors, even undiscovered authors, in our anthologies, but inclusion is invitational and very few can be chosen: each must meet our standard. With so many unprofessional books being published, some think we are entering a new Darker Age. We don’t think so. Self-publishing was once the ONLY publishing available. Commercial publishing has sliced and diced and deconstructed the novel into so many constituent parts, in order to claim a “bestselling” book in some tiny genre, that trash is once again triumphant (as Henry James said at the end of the 19th century). Yet literature survived James’ time. Is our situation so different today? Our books may challenge readers with small vocabularies unless those readers aspire to become better readers: reading is a skill to be constantly improved. The better the reader, the better that reader will like the books we write and publish. There are many books – some published by New York’s “taste-making” publishers, that blatantly offer “trash triumphant.” Good for them. It has always been so. In the Olympic poetry competition at which Hesiod and Homer contested, Hesiod won for “Works and Days,”beating Homer’s “Iliad.” How many know of “Works and Days” today? In its time, it was more politically correct. Whether or not we are entering a New Darker Age, publishing today is characterized by a lack of any objective standard of “good” or “bad,” as is so much entertainment and commerce. Fine. The good books will find their way; the semi-literate will find books to their taste, and everyone can be a part of the growth of literature in the new century. You can get your neighbor’s book about their travail at the hands of a local hospital for free on Amazon, but you can also get Shakespeare or Dante or Sun Tzu. Your mind is in your keeping; what you do with it is your choice. Become increasingly literate. Bead writers better than you are. The urge to write a story confers neither the ability to write a story nor the right to be read: bring your reader with you into a special world, where you want to be, and hopefully where the reader will want to be. Take no other advice; show your work to one person only, whom you trust; do not waste time with groups of writers no more experienced than you. Writing is a solitary sport. Wake of the Riddler, the “Author’s Cut of this iconic Sacred Band of Stepsons Tale, is now available not only as part of “the Fish the Fighters and the Song-girl” anthology, but also as a revised and expanded stand-alone short novel for Kindle. Here’s the beginning of this classic story, first published in Thieves’ World #10 in the 20th century. Tempus was gone from Sanctuary, taking his Stepsons and the Rankan 3rd Commando with him, leaving only outcasts and dross behind. In the wake of the Riddler’s departure, the town seemed more changed than it should have been because one man (called variously Tempus, the Riddler, the Black, and more scatological appellations) had gathered his private army of less than a hundred and ridden north. Sanctuary seemed emptied, drained, frightened, and confused. It cowered like a snow rabbit run to barren ground and surrounded by wolves. It shivered and sniffed the breeze, as if undecided which way to run. It hunkered down in des-perate paralysis, seeming to dream of better days while the cold spring wind blew wet promises of life inland from the sea and the wolves skulked closer, red tongues lolling from slavering jaws. Among fetid streets on this spring evening in question, militias are keeping order, stamping around corners with deliberate tread. Whores whisper rather than croon in their doorways. Drunks stumble along whitewashed walls, afraid to stagger boldly in gutters where beggars lurk with ready blades. And the wind comes in off the uneasy ocean with a chuckle on its breath: Tempus, his Stepsons, and the 3rd Commando have left the town to its fate, ridden off in disgust to new adventures capable of resolution, wars winnable, and glory attainable. Sanctuary is not only doomed but shunned by its last best hope, the Riddler and his fighters. The wind thinks nothing of whipping the town vacant, of chilling its nobles to the bone, of locking the neutered sor-cerers in their Mageguild and the impotent soldiers in their barracks. The wind is Sanctuary’s own, wind of chaos, gale of gloom. Spring has never felt so ominous in the Maze as it does this season, where the first rough gusts blow detritus worse than rotting rinds and discarded rags through the streets. The sea wind rattles against the plate armor of the Rankan army regulars, clustered in fours as they police what can’t be policed. It flaps the dark cloaks of Jubal the slaver’s beggars, his private corps of cold enforcers who sell protection now at stalls and bars where Stepsons used to trade. It keens toward uptown and beats on the barred windows of the Mageguild where necromancers fear the unleashing of their dead now that magic has lost its power, more even than they fear the wrath of whores whose youth-and-beauty spells have worn away. And the wind sneaks uptown, where what is left in Sanctuary that is noble tries to carry on, have its parties amidst the rubble left by warring factions of the various militias, by witches and warlocks, vampires and zombies, ghosts and demons, worshipers and gods. This wind is of the sort you may remember, coming out of a gray wet sky which makes an end to boundaries and hides horizons. Sounds seem to come from nowhere, go no-where. There is no distance and no proximity, no future and no past. There is no warmth, even from the one beside you. When you reach out to take a hand for comfort, that hand is clammy as the grave. On such a day, the stirring of life these gusts portend is only legend, as if the wind itself is here to reconnoiter the very earth and then decide if the world deserves another spring.